Hello and good day, fellow readers! 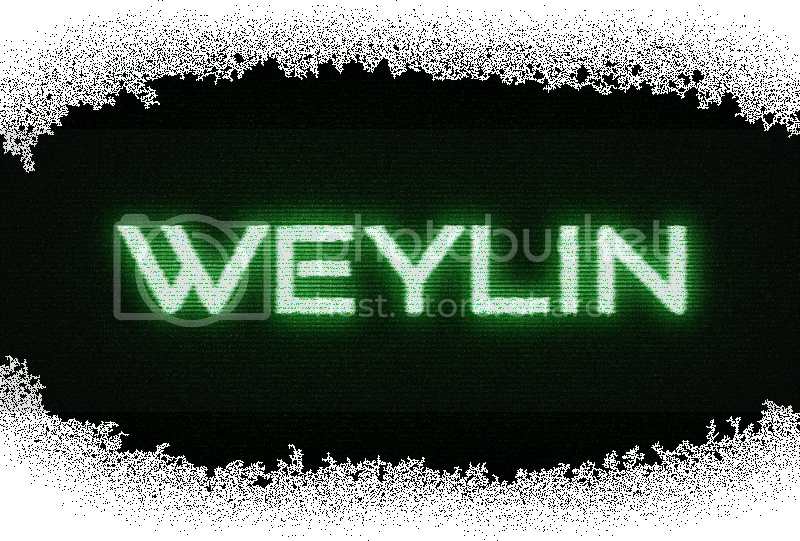 This is a tutorial on how to create a night vision-y text effect that looks similar to the MW2 or the Matrix title. Fill the background with solid black. Make a new layer . Choose a font with the text tool and write the desired text in a dark green colour (the one I chose is called Good Times). I should be a bold font, font size about 70. Duplicate your text layer . Go to Adjustments -> Brightness / Contrast and set both values to 100. The text should now be white. Toggle the Layer Visibility off. Go back to your green text layer. Apply Effects -> Photo -> Glow with Radius 20, Brightness 90 and Contrast 60. Apply Effects -> Blurs -> True Blur with a Radius of 21. Reapply Glow , this time with Contrast set to -100. A higher contrast will make it lose its green colour. Duplicate the layer and apply Effects -> Stylize -> Seismograph with Line Spacing 4, Line Width ~ 2.35, Segment Size 6 and Deflection 3. Toggle the visibility of the white text layer back on. Set the Blending Mode of the Seismograph layer to Multiply. Apply Effects -> Distort -> Crystalize on the white text layer, Cell Size 2, Quality 5 (always highest quality!). This gives the text a grainy look. Apply Effects -> Noise -> Add Noise with Intensity 40, Color Saturation 0 and Coverage 100. 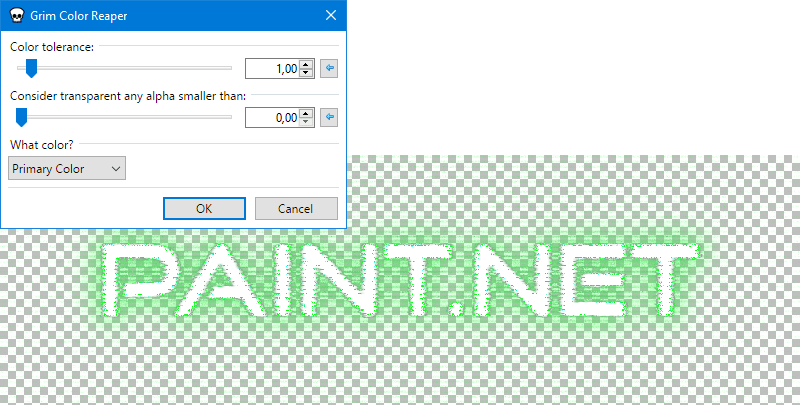 Set Layer Blending Mode to Reflect. Duplicate it and set the Blending Mode to Color Dodge. 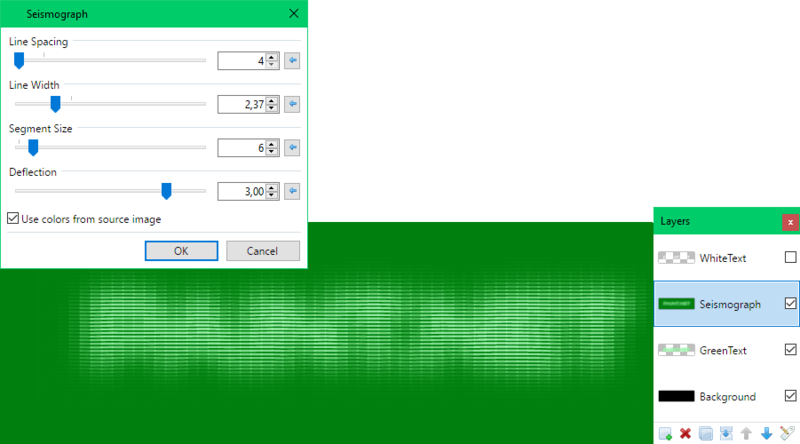 Select the Seismograph layer and use Add Noise with the same settings as in step #11, but increase the Intensity to 45. Duplicate the Glow layer (the one under Seismograph) and use Effects -> Distort -> Frosted Glass with Maximum Scatter Radius set to 200, Minimum Scatter Radius set to 3 and Smoothness set to 8. Use Effects -> Stylize -> Halftone with the Line Shape, Size 5, angle 0, Contrast -100, Brightness -25 and Quality, of course, 5. Now merge the layers. First, merge down the layers Glow copy, Glow and Background, then Seismograph and Background. Finally, merge down the WhiteText copy, WhiteText, and Background layers. I hope you like the outcome, criticism, be it positive or negative, is always welcome! However, there is a surprisingly easy solution to this! Background gone! You can now create a new layer under the text and fill it with whatever colour or image you want. Use Ed Harvey's Color Tint on the text layer to adjust its colour if you don't want it green. Great tutorial! I'll have to use this sometime. Nice outcome, it has good contrast..
Is that also the Good Times font? I'm curious how it would work (especially the Motion Blur part) on thinner fonts. BTW what's that thing you got pinned to your taskbar to the right of Skype? The Text Effects section needs it. Gonna move to Rythm soon, I think. I like this tutorial, I might use it in a future signature. Nice idea, though it could be difficult. I think I should figure out how to isolate the text effect from the black background. If I remove it, the Multiply blending mode goes to hell.. If only there were something like a ctrl-shift-f for certain layers. Great tut nice stuff man! This is my result. im a total n00b on paint.net so go easy. what effect is that with your signature? it looks awesome. mind telling me? Well, that looks interesting, but nothing like my outcome. What did you do differently? Better use Grim Color Reaper, it should give you a way cleaner result. Nice tutorial (: this is my outcome. I followed the tutorial, then cropped it to its size, added Film (Grain 2, 0 Discoloration, 0 Distortion) and Sharpened (20) twice.